I, Charley Morton, time traveler and science geek, have set out to record my interview with the great leader, diplomat, patroness of the arts and promoter of Renaissance culture as part of my "Superheroes of History" project. The discontent of the people is more dangerous to a monarch than all the might of his enemies on the battlefield. Before there was Instagram, exceptional people were "selfie curators." 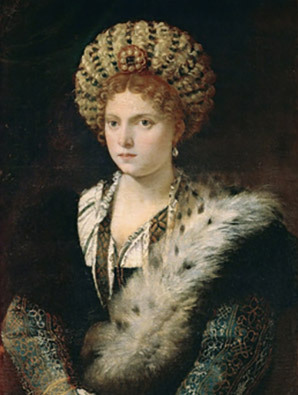 I have been curious to learn about a Renaissance woman who carefully cultivated her image, the Marquesa (Marquise) Isabella d'Este of Mantua. 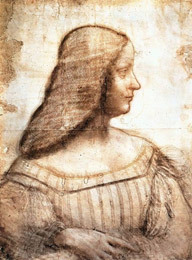 Portrait painters were carefully selected to enhance the reputation and brand of their subjects; Isabella was able to choose the best-of-the-best, including Leonardo da Vinci and the famous Italian painter Titian to burnish her own reputation. But Isabella, known as First Lady of the World, was also a politician, diplomat, humanist, feminist (for her day, really! ), singer, inventor, fashionista and perfume maker, art partron and the mother of seven children. Here is my interview with the marquesa of Mantua—part of my "Superheroes of History" project. Charley Morton: Marchesa, what was life like for you when you were my age? Isabella d'Este: I was fortunate, as a young girl, to receive an education. I was the oldest of six children and raised in a family where learning and culture were important. Charley Morton: Was that a usual thing for a girl in your time? Isabella d'Este: Being born to a ruling family, I was fortunate to be introduced to schooling, language and ideas. I learned Greek and Latin and loved Roman history. I learned to recite the works of Virgil and Terrence from memory. My tutors, Jacopo Gallino and the poet Battista Guarini taught me to discuss and debate affairs of the day with visiting ambassadors—diplomacy and politics were second nature to me. But music was my first love: I loved to sing, play the lute and create new dances. Charley Morton: Right there with you, Is! I love music, too. I play violin and am learning to compose. Isabella d'Este: Violin? I know not of such an instrument. Charley Morton: Oops! Kind of like a lute, but not. I forgot that violins are a not-yet. Hmm, I wonder if Gian Battista Gaurneri, who was a famous violin maker on a par with Amati, was a descendant? Another mystery to hunt down! Isabella d'Este: My uncle Leonello, the Marquis of Ferrara, created a flourishing center of arts and literature at the University in Ferrara, where I was born. When my father Ercole I d'Este came to power, he continued to support humanist education and the arts. I studied Italian poetry with the Ferrarese poet Antonio Tebaldeo. My music tutor was Johannes Martini, who was in charge of my father's orchestra. I learned to play musical instruments with Girolamo da Sextula, and the famous dance master Lorenzo Lavagnolo taught me to dance. Charley Morton: Good on you! My mom teaches me music; she plays with a sinfonia. And my dad coaches my soccer team, so I get what it feels like to have your fam supporting you. But I'm interested in how it felt to be a woman in charge in Mantua back in the day. After all, there weren't many women leading entire countries. Isabella d'Este: It was because my husband, the Duke, was so often off waging wars. I was more intent on creating and supporting culture than fighting. So I commissioned artists, sculptors and musicians to create beautiful works, and traveled far and wide on the Italian peninsula—always wearing fashions that reflected my love of beauty. Charley Morton: You were a trendsetter, no doubt. Italian fashion is still pretty hot right now where I come from. So how did you get the idea to invite so many portrait painters to create your likeness? Isabella d'Este: You will have noticed from your own travels, no doubt, that all the noble courts in Italy during the Renaissance celebrated the ideal of beauty. As I wrote to my brother-in-law, there are many portraits of me across Italy, but that I was "afraid I may be annoying not only Your Lordship but all of Italy by sending around these portraits of my face." The Duke replied to say that he thought the painting very good, even if it did make me stouter than I had been the last time he had seen me. No matter. I gained fame by influencing court fashion across Italy and France. You may see an example of this in the Titian painting, where I wore a cap of my own invention, known as a capigliari. It was Bellissima—this large, ribbed headdress adorned by precious fabrics and jewels. 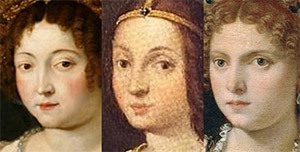 Noblewomen throughout Italy copied my style. Charley Morton: Hmm, so you your portraits were a way of building up your brand, as it were? That doesn’t sound so different from my own time (see: the Kardashians). But selfies weren't your only accomplishment, right? Isabella d'Este: I was very involved in the arts myself, creating perfumes and bracelets. I invited writers, artists, and poets to her home to exchange ideas and corresponded frequently with a variety of prominent figures. My letters offer a woman’s point of view on Renaissance Italy. Charley Morton: Artist, fashionista and patron of the arts. Were these your main accomplishments? Isabella d'Este: Of course not. In the time my husband was off at war, beginning in 1509, I was made regent by the state, and took command of the city's armies. During that time, I successfully held off enemy incursions into my city. In 1512, a peace treaty was signed, and my husband was finally released. But on his return home, his rule was weakened. He became jealous of my power. So I took off for Rome and the court of Pope Leo X. I was regaled there like a queen! Charley Morton: A queen: was that what you dreamed of becoming? Isabella d'Este: I am not so vain as all that! After all the conflicts died down, I left Rome, and in my sixties, returned to Mantua. I turned the city into a cultural center! Charley Morton: So that quote about securing your leadership in the face of discontent of the people... was creating Mantua as a center of culture your idea as a way to keep people happy? Isabella d'Este: Culture and learning! I established a school for and young women. I turned my palace into a museum, which housed the finest art. There were many young women who, like me, could improve their circumstances through education and creative expression. So, yes, education for all. But then, when can use your intellect and wit, to befriend influential people, as I have done, you may wage peace. Through my influence, I was able to advance my own political agenda. I credit my relations with the French King Louis and the Pope as instrumental in keeping my city safe during the Italian wars and French invasion. Charley Morton: For teens like me who want to do it all, do you have any advice? Isabella d'Este: For me, it is twofold: first, it is the gift of an education, and second, to use it for the advancement of society. Leadership—and political diplomacy—must be used in the service of the peace. For women as well as men. Charley Morton: We have an expression that my mom uses: "A woman's place is in the House. And the Senate. And the White House where our president lives in Washington!" Isabella d'Este: A woman ruling in una casa bianca – this I would like to see one day! Isabella D'Este & Music. IDEA Musica. Web. 10 Jun. 2018. How Isabella D'Este Spread Ideas. Digital Travels @ UC Berkeley. Web 12 Jun. 2018. A powerful and well-regarded leader, politician and diplomat, Isabella d'Este might also be the first woman to launch a selfie story. By tapping the best portrait painters of her day, Isabella carefully curated her image throughout her lifetime. The Dinner Party is an installation artwork of place settings by artist Judy Chicago designed to evoke the spirit of leading women in Western civilization who have often been forgotten or minimized in history. 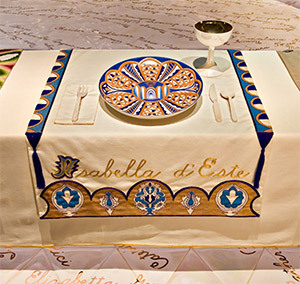 Isabella d'Este's place setting employs motifs and techniques that reference both her role as a ruler, and the Renaissance art she supported during her lifetime. ...the plate, painted in gold, white, and royal blue, is characteristic in its color palette and motifs of the popular Urbino majolica ceramicware, created in factories that d’Este supported. The gold sections of the plate are raised, providing the structural framework for the design. The plate highlights Renaissance artistic innovations, including the use of perspective, horizon lines, and vanishing points. These techniques, popular in antiquity, were revived in the Renaissance and were used to create three-dimensional and realistic works. These artistic ideals are represented by the colonnade in the center of the plate, which has a vanishing point that makes it appear to recede into space. The runner is designed like a royal banner, complete with tassels, shields, and fleur-de-lys, patterns reserved for the ruling classes. The insignia on the back of the runner was derived from the d'Este crest. The tassels reference the similarly ornamented gowns shown in many Renaissance portraits. 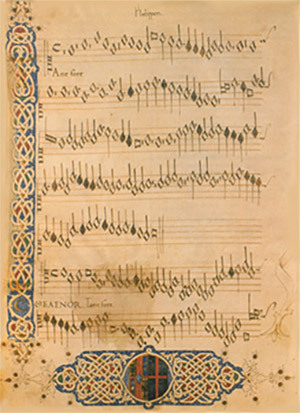 An illustrated songbook given as a wedding gift to Isabella d'Este shows decorative pointers connecting the final note on the left-hand page to the first note on the facing page. The designs in the original chansonnier include gargoyles, flowers, birds and hands. Courtesy of Universal Leonardo: Leonardo da Vinci online. Leonardo da Vinci's drawing of the young Isabella is thought to be the only portraits of her as a young girl. Leonardo da Vinci left Milan in 1499 when the French army invaded Italy. On his way to Venice he stopped at Mantua, where Isabella d'Este asked him to paint her portrait. This famous drawing is a sketch for the portrait that was never painted; despite its fragile state of conservation, it is one of Leonardo's finest head-and-shoulders portraits, here with the head in profile. It is also the only known drawing by the master that is highlighted with several colored pigments. Another artist, Titian, depicts her as a young woman, she was around 62 at the time of this sitting. Isabella was socially ambitious and aware of the effect a painting by a renowned artist might have on her reputation and prestige.